I have always been a believer in keeping fish recipes as simple and as close to nature as possible and this pan seared halibut recipe is no different. When you prepare fish in a way that highlights its natural oils and salty flavor there is no need to overwhelm it with a variety of marinades and sauces — save that for your chicken. Instead I believe in showcasing the incredible flavor of wild caught fish with fresh produce that compliment and respect everything that the fish is providing. Growing up in a fishing town, my Dad would take my sisters and I down to the fishing docks to watch the fishing boats pull in and carry the freshly caught fish from the day. We would watch them weigh their catches and prepare the fish right there on the dock and at a young age it was a process that connected me deeply to the fish I loved so much and my local environment. You can’t grow up on the ocean and not develop a respect for what this incredible body of water offers us and how strong and powerful it can be when it wants to be. This respect for the ocean is what has always driven my respect for the fish that live within it and the way in which we are able to benefit from everything they offer us nutritionally and culturally. So it is the least I can do to create a recipe that doesn’t cover but showcases the fish that come from the oceans that surround the town I grew up in, that were caught by local fishermen and women who I grew up with, and provide one of the last true connections to a wild nature that we will never control and will always be at the mercy of. While I am well aware of the many issues in our global fishing industry (and will address them in detail in another article) there are ways in which we can support sustainable fishing practices and bring fishing back to what it once was, in the same way we are our land based agriculture. But if you are interested in how to choose sustainably sourced fish and support a better fishing system I would highly recommend that you begin to acquaint yourself with the seasonality of fish, because yes fish have seasons. A quick google search will tell you what fish are in season in your local area (or the closest geographic area if you don’t live in a coastal community). I also would recommend checking out the Seafood Watch website and phone application from the Monterey Bay Aquarium which has the most extensive list of information and recommendations about what seafood to avoid and choose around the world. You can also look for the Marine Stewardship Council blue label that is recommended by the Monterey Bay Aquarium for sustainably approved seafood. This website and label was helpful for instance when choosing where to source the halibut for this recipe (which was sourced by a Marine Stewardship Council approved fishery in the Canadian Atlantic). Since the halibut fisheries here in the Eastern USA Atlantic have been overfished it was important to choose a fishery that was using sustainable methods and not compromising the halibut fish stocks in their area. Luckily, we also live close to the Canadian Atlantic border and so this fish is within our general region and one that is commonly sourced by the incredible year round farmers market we have near our home. Now let’s get into some of the details of this pan seared halibut recipe. When it comes to pan seared halibut you want to make sure that the pan you are cooking in is hot and lightly coated with avocado oil or coconut oil (any high smoke point oil) before beginning the searing process. This will allow for the skin and outside of the fish to get a nice flaky char, while the middle of the fish is cooked to perfection. Once ready to pan sear your fish simply place the halibut skin side down on the hot pan and cook for 3-5 minutes, or until a nice golden char begins to form. Then simply flip your halibut and cook on the other side until the fish is cooked through. At this point I personally like to melt a little butter and squeeze some lemon into the pan, which I will then drizzle over the fish once it has finished cooking. In a cast iron pan (or a regular cooking pan if you don’t have any cast iron) heat 1 tablespoon of avocado oil over medium-high heat. Next, cut your halibut into two pieces and place the halibut skin side down in the hot pan and cook for 3-5 minutes or until a golden crust forms on the bottom of the fish. Once a golden crust forms, flip the fish and cook on the other side until it is cooked through. Roughly another 3-5 minutes, this will depend on the thickness of your fish. If you would like at this point you can also melt three tablespoons of butter and squeeze half of a lemon in the pan with the fish and then drizzle it over the halibut. While the fish is cooking, in a separate large pan over medium heat combine the olive oil, sliced fennel, chopped garlic, sliced leeks, white wine, salt, and pepper. Allow the veggies to cook until they are slightly translucent before adding the canned cannellini beans to the pan. Cook for another 3 minutes or so (not too long or the cannellini beans will become too soft), and then remove from heat. 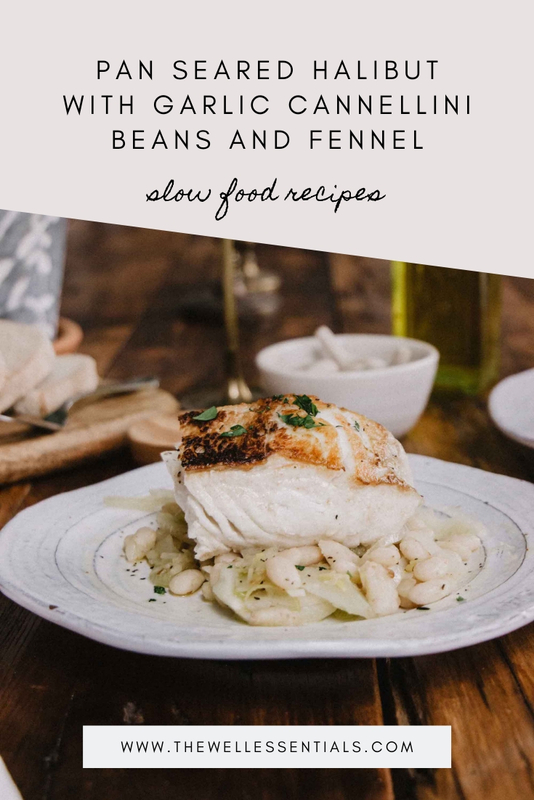 Plate your pan seared halibut on top of a layer of the garlic cannellini beans and fennel mixture and sprinkle with parsley, a squeeze of lemon, and a drizzle of olive oil.